Tesco, Britain's biggest supermarket group, is to buy family-owned convenience store chain Adminstore. The £53m ($98.5m) deal will see Tesco take a bigger slice of the UK's fast- growing local store market, currently dominated by the Co-operative Society. Adminstore's shops trade in London, mainly under the Europa, Cullens and Harts brands. But the Big Food Group, owner of Iceland food stores, has said it will ask the government to block the deal. "There is a clear case for this acquisition to be investigated and we will be making representations to the competition authorities to this end," said Big Food Group chief executive Bill Grimsey in a statement. The Federation of Wholesale Distributors, which represents wholesalers supplying more than 75,000 independent local stores in the UK, also called on ministers to veto the deal. 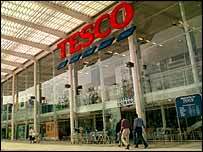 Tesco said the stores would undergo a rebranding to become the supermarket's own Tesco Express outlets. However, it denied that the move would allow it to dominate the market. Tesco said that even after the acquisition of Adminstore, which is conditional on shareholder approval and regulatory clearance, it would only hold about 6% of the convenience store market. The UK's traditionally fragmented convenience store market has become increasingly competitive in recent years. The Co-op became the market leader with the acquisition of struggling Alldays in 2002, while in the same year Tesco acquired 870 T&S convenience stores. The sale of Adminstore will also provide a windfall for managing director Jitu Patel, who started the business from a single shop in 1979. In the year to September 2002, Adminstore reported pre-tax profits of £2.1m, on turnover of £72.8m. Last week, Tesco unveiled a healthy 7.5% rise in like-for-like sales over the Christmas trading period, boosted by demand for non-food items including clothing, CDs and DVDs.